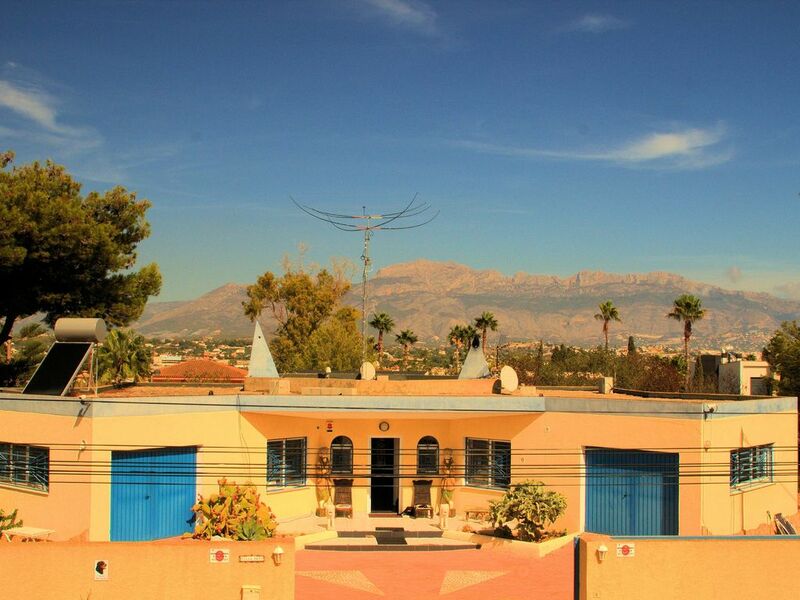 Bungalow in Albir, Costa Blanca North, Spain - Peaceful Private Location, 15 Minutes to the beach. This exclusive Villa is situated in the silent part of Albir, and give you 100% privacy in a closed walled garden. 100% save for children ore your pets. This Exclusive Villa is furnished with colonial antic English/Indian and rich hand knotted carpets. The kitchen is fully equipped. Bedlinnen from the best Indian cotton is provided, as well kitchen and bath towels. The TV is 55 inch and gives you more than 300 international channels including all Sport and Movie for Holland, Belgium, Germany, BBC, SKY, ITV and all SPORT Pay channels FREE. Off course there is FAST WIFI free off charge. All 3 bedrooms have independent air-condition. The swimming pool is heated as you like. The exclusive Villa is heated with a central heating system, and a great open fire for the cosy evenings. For your easy, the maid will come every Friday morning to clean the Villa ( by rent from more, than one week only ) to your willing, this service is included in the rent price. And last but not least the entire Villa is sealed against mosquitos, all bedrooms and bathrooms, kitchen and living. All bedrooms have air-condition. My name is Frans Hoovers. I´m from The Netherlands and living in Albir Spain. I have lived in my Villa for more than 7 years, and hope to do that many more years. Now I´m traveling the world, thats why I do rent this beautiful Villa, for the time i´m traveling. Albir is a silent and very pretty village. There are more than plenty supermarkets, restaurants, pubs, shops. The society is correct, there are no high buildings, the image of the village is well looking for by the officials. If needed, professional healthcare is nearby. Almost all language´s are spoken in Albir. Its easy to access by car / taxi ore bus. And last but not least its remoteness from the crowds. This properties give you privacy, as much you like, possible to seal view swimming pool . There is no surrounding noise. We have all day sunshine, and speciale winter terrace. The combination, central heating, open fire, ac heating bedrooms, give you all choices where to heat. toilet, shower, Walk in shower very luxury build in 2017. En-suite bathrooms in bedroom 1 and 2 with bath and shower, bath with lowered entry and elderly support, wc, bidet. All rooms sealed against mosquitos. Living room 85 m2 , 55 inch TV, Stereo, WIFI, seats 6 persons on 4 stress free chairs. Writing table. Diner table with 6 leather chairs in the fully equipped open kitchen. Albir has a drivings range free to use. There are more than 6 golf course close by. Outside: The garden is maintain free. Has nice orange and olives tree´s, and many cactus es. The garden is fully fenced with walls on all sides. The outdoor kitchen is fully equipped and has even a dish washing machine, gas barbecue, refrigerator and deep freeze. The terras can be fully covered with sun canopy also on the side. The swimming pool is 40 m2 and heated if you like. The swimming pool and sun terras gives you 100% privacy. Sun beds and chairs are provided. Utility Room: extra large deep freezer. Extra sink and kitchen counter-top, washing machine, dish washing machine. The utility room is located in the garage accessible from the kitchen. Cleaning / Towels / Linen / Maid service: Bedlinen en towels from the best Indian cotton are provided. The property is cleaned every Friday morning by our maid to your willing. Pls note bedlinen en towels washing is not included. For Final cleaning we are charging Euro 125,= Other: The master bedroom has 2 single connected beds both in depend fully adjustable on head and feet in height. The 2nd bedroom is equipped with antic Queen and King from the 19th century, the mattress are new of course. The 3rd bedroom with 2 new single beds. The villa is very spacious indoors. There are two modern ensuite bathrooms plus a separate toilet. There is a large sitting room and kitchen. We found everything indoors to be clean and tidy. There is a good amount of space around the villa with a lovely pool. However the outside could have been cleaner. Communication was very good and we had to ask the caretakers for assistance and they were very helpful. Location of the villa is perfect. No need to drive! Nice house, large kitchen and living room and good space bedrooms. Nice neighborhood within walking distance to the beach and the city centre. Nice pool and garden. The outdoor cleaning of the porch and terrace could be better and the showers in the bathrooms should be changed. Otherwise a great house. We have upgraded the bathrooms to Luxery Bathroom with walk inn shower. We booked this Villa completely blind, not knowing anything about the area, location. However, for us as a family of four (2yr & 4yr old BOYS) this worked out very well. When we arrived to the gated entrance to the villa, it certainly gave us the peace of mind on the security front, as there is a 2 metre high wall around the whole perimeter, large electric steel gate, CCTV on the outside, Security bars across the windows, also the front and rear doors were solid. So being very security conscious myself (8 CCTV cameras on our own home) I would have to give this place 10/10 for security. Inside there was some lovely furniture, however this was not ideal for the kids, as some of it looked valuable and fragile. So that evening we just child safe the villa (Moving all valuables in one room). The inside is very spacious, and ideal for a family, plenty of room. The furnishings were all of a good quality and the beds really comfortable. The two singles beds were quite high off the floor, so we did just take the mattress off the frame, so no issues there. But with TV's. 100's of channels and air con in all rooms, you cannot ask for more. Very nice, lovely size and the kids loved it. no fence round it, which is very common in Spain. The property was very well located, 10 min walk from the shops, and a 5 min drive from the sea. The actual street seemed safe and not at any point did we feel any different. All parties involved stuck to their word, with nothing under hand going on. The cleaners were very helpful, with great local knowledge. Good communication throughout the whole process. So overall our family loved it, and we will be looking to book again in the future. would STRONGLY recommend this landlord and the property. A large well equipped villa ,we are only a couple but had friends and family staying . The villa proved ideal as guests have their own en suite. We found the villa very comfortable with everything provided in clean and good condition, during warmer months we would have enjoyed using the pool and the great outdoor kitchen, however the wood burner was very welcome during our January stay. We are happy that you have had a wonderful time in our villa. We are glad that you have found everything needed was provided and in good and clean condition. We hope to see you back in the future. Walking time trough the main shopping street van Albir is about 15 minutes to the beach, there are no steep hikes, easy walk. Supermarkets are very close by, the nearest is 500 meter only. Close airport is Alicante about 65 km. Taxi service can be provided for Euro 55,= on request, one way. Care hire is easy available on the airport, pls make reservation trough internet in advance. Albir is located 8 km from Benidorm, and 45 km from Alicante. Albir is known as a quiet village which will be normally visited by tourist above 30. Albir has plenty of restaurants and pubs. Albir has more than 6 supermarkets, off course 3 Spanish, 3 European as Lidl and 1 Dutch supermarket. Plenty off Dutch / Norway and English food is available. Booking Notes: Pls book by email on the website. By reservation we are asking advance down payment from 20 %, balance rent to be paid in full, 6 weeks before arrival date. We are charging use off electricity separate, separate meter is installed to monitor your consumption, charging is Euro 0,35 pro KWu. Final cleaning cost Euro 175,= and Safety deposit Euro 500,= to be paid in cash by arrival. Changeover Day: We are flexible in change over day´s. Notes on prices: For longer stay then 1 month, we are considering discount on our prices, excluding winter. Pls. send your enquiry trough this website.